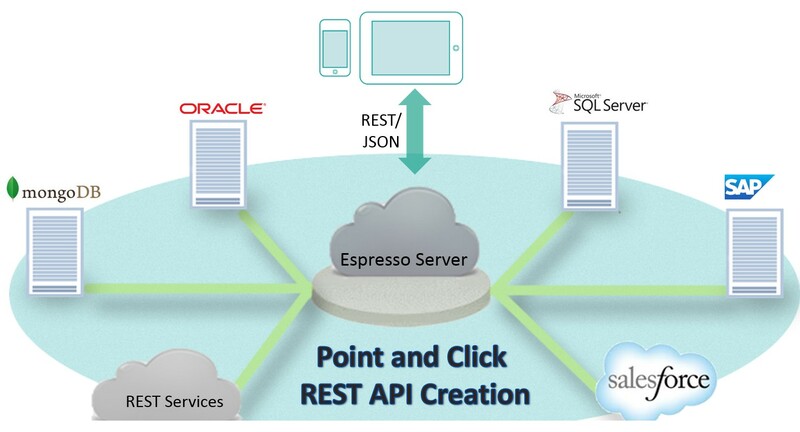 Espresso Logic, which offers a backend service to help businesses connect applications with SQL data sources, is adding NoSQL to the mix with new support for MongoDB — as well as support for Salesforce.com and Microsoft Dynamics business applications coming soon. The company says its service makes it easier to create RESTful APIs that facilitate data flow from repository to applications. REST, short for representational state transfer, has become something of a lingua franca for connecting disparate applications. Espresso Logic CEO R. Paul Singh (pictured above) said the product and its reliance on reactive programming lets non-programmers accelerate development by connect apps by clicking, dragging and dropping — or perhaps writing a few lines of code. That promised ease of use appealed to Bill Kuklinski, director of systems development for Boston’s Joslin Diabetes Center. His group doesn’t have the IT and programming resources needed to integrate applications by hand. Like many organizations Joslin runs many legacy applications that are treasure troves of data needed by other applications. And as the need to let patients funnel readings from their glucose monitors into the center’s system means that data has to traverse organizational walls. Navigating an array of in-house healthcare apps and those built more with a consumer in mind, is tricky. “Everyone has a unique set of problems they want to report on and unique analytics and that requires custom development. If you can’t get the data from those data sources, every vendor’s answer is ‘here’s our API,'” Kuklinski, an Espresso Logic customer, added. Supporting REST makes life easier because the business doesn’t don’t have to support a zillion different APIs. The so-called API economy has led to the rise of companies such as Apigee that manage APIs and which just added new analytics services. Espresso Logic competes with backend services platforms as Strongloop, which recently announced a life-cycle management tool for Node.js-centric REST APIs; Kinvey and Dreamfactory. Gigaom Research analyst Rich Morrow agreed that it’s important to support the right APIs, but there’s more blocking and tackling to be done. “Exposing your datastore to mobile endpoints via an API is really powerful, but looks way more easy than it is — you’ve got to build accessibility, security, access controls, management and extensibility. It makes way more sense for most organizations to buy the capability rather than build it themselves,” he said.